1. Determine which stones are dead, according to the rule set used. 2. Note your territories: They are the empty points surrounded entirely by your living stones. 3. Remove all dead stones from your territories. These can be placed back in your opponent's bowl. 1. Now you want to make the empty territories you surround be multiples of ten points. To this end you can simply remove stones of your color from the board and return them to your bowl. You can also take stones from your bowl and add them to the board. This step often distresses people. Remember that with area scoring, you get one point for each empty point you surround, and one point for each stone on the board. So if you take a stone off the board, but leave an empty point it doesn't change your score. Similarly, if you fill one of your empty points with a stone of your own color, it also doesn't change your score. 2. Make a note of the number of empty points. This should be a nice round number, a multiple of ten. Some people place one stone for every ten points on the table, up against the board, as a reminder. 3. Now count your stones. At this point you can destroy arrangement of stones on the board and simply clump the stones into piles of ten. If both players are counting their score this way, then you need to make sure that you both have completed counting your empty areas before either of you start this part. Once you start this part, the empty areas on the board will be destroyed. However, see half counting, below. 4. Add the number of stones counted in step 3 to the number of empty points noted in step 2. This is your score. 5a. 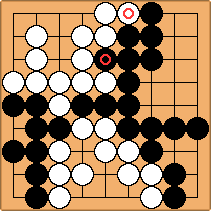 If there is komi, add it to White's score. Divide this last number by two, and all you need to know is if Black's score is more or less than this 'half count'. If Black has more, then White has less, and Black wins. If Black has less, then White has more, and White wins. For every point the winner has over this half count, the Loser is a point below. So the difference between the two scores is twice the difference between the Black's score and the half count. To deal with komi, subtract the komi from Black's score. There is a Chinese counting example with step-by-step diagrams. When performing step 3 above, it is often desirable to create large rectangular shaped empty territories. One can swap equal numbers of Black stones and White stones as and where convenient, to make it easier to clear the stones to create the large rectangular shaped empty territories. See example below. We can interchange the and stones to create a 5 x 4 = 20 point empty space for White on the upper left corner. When using half counting and dealing with points that don't score , one can simply fill in equal numbers of Black and White stones in those points. Thus, the number of such points is reduced to either zero or one, simplifying the calculation. Under area scoring, dead stones are usually determined by agreement, and otherwise by playing it out, but details on this vary between rule sets. The word dead may not always be the most appropriate word to describe the stones to be removed, see discussion. For example, shared liberties in seki. Anonymous: Question: How do players using Chinese counting rules estimate the score during play? Counting territory seems easy to me, but if the players are not keeping captured stones separate and visible, it becomes more difficult. Counting the full territory and stones, even of just one color, would seem even harder, but perhaps that is just because I'm not used to it. Your score is the total of your territory and your living stones on the board. You can estimate your score during the game by keeping track of the difference between your number of living stones on the board and your opponent's and the difference between your territories. If you don't need a really accurate estimate you can use the Japanese count because it only differs from the Chinese count by one point or so.